When a child dies, there is an outpouring of creativity – drawings and stories from other children. Because communities will be unprepared, anything will do as a temporary mailbox. Then you might want to create a task of designing a commemorative mailbox. What do you think it should look like? Does it need wings? Or a cuckoo in a caging? Or a halo? Or helmet? There should be two slots: one for private letters to the child, which will NOT be opened, and the other for open (not private) messages or contributions to the website. If you would like to do this project, you can draw your designs, or write your ideas, or even just draw some pictures you would like to have as part of the mailbox. Here is an example and some ideas to start with. A retablos is a little picture shrine (holy place) containing a photo or drawing of the loved one and or some things they liked, in their memory. It is a Spanish word and they are very common in Mexico (in fact the whole mailbox is a sort of retablos). How can we describe what the world of a person was?! Maybe we want to describe what role the lost one played in our world!? With art, you can make objects that remind you of the person who has gone. You can write stories about things you remember, or things you talked about. Did they have a favourite painting, or song? This is for private letters to anyone special who is no longer in this world. These letters will not be read or opened, but will be placed in a treasure box dedicated to them. This is how you can have your private messages. Perhaps your school can keep the email address of the person who died for a little while, at least until you can set up a new email address for people to email to. 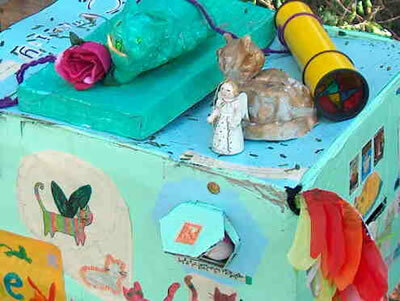 This is the community mailbox for drawings, stories, or ideas to do with the memorial project. These are for messages that you want to be part of the memorial project. Teachers can work with children to create artworks and stories to go in this letterbox. Projects for art works could include things like "the funniest thing I know about this person". She might have had a funny hat, or odd socks, or a funny pigtails hairdo. Missing some-one makes a lot of energy well up inside. This energy needs to come out, or you feel like bursting with sadness or anger. One of the best ways to use this energy is to pour it into something that you and the one you miss feel is important and valuable. The RSPCA accepts donations for pets who have had bad experiences, to help them back to health. The mail box needs some way of getting its messages to the loved ones who are gone from this worldIn our example, we have given the box wings to help our letters on their flight. In reality it may be the love we use writing and making our messages that is the true means of communication. No voyage of discovery or urgent mission would set out without a map and compass! We are using the sort of scope most likely to help this particular voyage: a kaleidoscope.